The original retreat for all senses in Croatia! 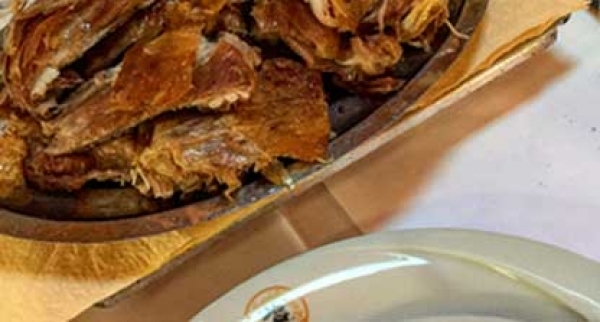 A treasure trove of amazing flavours, Boškinac gives you Pag on a plate. Savour each step of the local tradition of preparing lamb and enjoy award-winning Pag sheep cheeses, but while here, make sure you don’t miss out on other Pag riches: millennia old salt pans, the world’s oldest olive grove in Lun, intricate lace, protected by UNESCO. Ask us about our unique and original programs at Boškinac! 2+ nights, half board. Custom program based on the culinary heritage of Pag island with wine tasting and special wine pairing menu designed for our guests only. Ideal destination for exploring unique treasures of Pag Island. Also, a very popular venue for weddings and various presentations. In 1830, the local people got permission from the land’s owners from Rab island to start planting olive trees in Lun. They never thought of dividing the land amongst themselves, so today, between 70,000 and 80,000 trees growing here each have owners, signed on tree trunks by different marks. The land, however, doesn’t have any owners, but is considered to belong to the village Lun, inhabited by about 200 people. With some of its trees over 1500 years old and the title of one of three world’s best preserved olive groves, Lun has been protected as a botanical garden for over five decades now. If you like action, the most attractive time to visit is during picking season in autumn, however, a walk through the forest of Lun olives makes for a surreal experience any day.